This is an English translation of a paper published in Russian (but with proper Latin formulations at taxonomical novelties to make them validly published) on March 15, 2017 in Vavilov Journal of Genetics and Plant Breeding, Vol. 22 (2): 158-169. The Abyssinian pea (Pisum abyssinicum A. Br. ), concerned in this review, is known from Ethiopia and Yemen, where it is cultivated along with the common pea (Pisum sativum L. subsp. sativum). The continuously reproduced notion of its possible spontaneous occurrence in the wild ascends to suppositions made in the XIX century and is not based on any actual data. P. abyssinicum is of practical interest owing to its extra early ripening and resistance to bacterial blight. Morphologically it is very similar to P. sativum but its crossability with it is bad as either seed or pollen parent. Traditionally this reproductive barrier was associated with karyological differences. The Abyssinian pea karyotype is variable as 1–2 reciprocal translocations were reported. At the same time there are accessions not differing from the standard karyotype of P. sativum with respect to reciprocal translocations, yet their crossability with the latter is very low and the pollen fertility of F1 and F2 hybrids is lowered. Data were reported on influence of the region of Linkage Group III, containing a gene known to participate in the conflict of nucleus and plastids in remote crosses of peas, on the pollen fertility of hybrids with abyssinian pea. With their karyological variability, the known accessions of the Abyssinian pea are very close to each other genetically, as they diverged just about 4 000 years ago. The presence of alleles of molecular markers common with Pisum fulvum Sibth. et Smith on the one hand and with P. sativum L. subsp. elatius (Bieb.) Schmalh. on the other hand evidences in favour of an old hypotheses by L.I. Govorov that the Abyssinian pea originated from their spontaneous hybrid. This spontaneous cross may have taken place under cultivation, in Yemen or Afar Depression. A representative of P. sativum subsp. elatius was revealed, the F1 hybrids of which with the Abyssinian pea as a seed parent had fully fertile pollen. P. abyssinicum × P. fulvum crosses provide the best hybrid seed outcome among remote crosses conducted, so that P. abyssinicum can be used as a ‘bridge’ for gene introgression from P. fulvum to P. sativum. Rather a high level of reproductive isolation of the Abyssinian pea from other representatives of the genus conforms the biological species concept, however the disposition of P. abyssinicum accessions as a small cluster among accessions of P. sativum subsp. elatius on molecular phylogeny reconstructions violates the phylogenetic species concept. Most authors assume the Abyssinian pea as a species, Pisum abyssinicum, some as a subspecies, P. sativum subsp. abyssinicum (A. Br.) Berger. Perhaps it would be most correct to consider it as a hybridogenic species. Because of the recent subsuming of the genus Pisum L. into the genus Lathyrus and with respect to the existing name Lathyrus abyssinicus A. Br. (a synonym of L. sativus L.), the Abyssinian pea was given a new name Lathyrus schaeferi (A. Braun) Kosterin (Vavilov Journal of Genetics and Breeding 21: 167. 2017) (pro Pisum abyssinicum A. Braun), in honour of Hanno Schaefer, who substantiated the revision of tribe Fabeae by molecular reconstruction of its phylogeny. The paper here translated contained new combinations of Lathyrus sectio Pisum (L.) Kosterin (Vavilov Journal of Genetics and Breeding 21: 168. 2017) and Lathurus fulvus (Sibthrop et Smith) Kosterin (Vavilov Journal of Genetics and Breeding 21: 168. 2017). Ben-Ze’ev, N., Zohary, D. (1973). Species relationship in the genus Pisum L. Israel J. Bot., 2, 73-91. Berdnikov, V.A., Bogdanova, V.S., Rozov, S.M., Kosterin, O.E. (1993). Geographic patterns of histone H1 allelic frequencies formed in the course of Pisum sativum L. (pea) cultivaion. Heredity, 71, 199-209. DOI 10.1038/hdy.1993.125. Berger, A. (1928). Systematic botany of peas and their allies. The Vegetables of New York. Vol. 1. Part 1. Peas of New York. Albany: J.B. Lyon Company. Bogdanova, V.S. (2007). Inheritance of organelle DNA markers in a pea cross associated with nuclear-cytoplasmic incompatibility. Theor. Appl. Genet., 114, 333-339. DOI 10.1007/s00122-006-0436-6. Bogdanova, V.S., Berdnikov, V.A. (2001). Observation of the phenomenon resembling hybrid dysgenesis in a wild pea subspecies Pisum sativum ssp. elatius. Pisum Genet., 33, 5-8. Bogdanova, V.S., Galieva, E.R., Kosterin, O.E. (2009). Genetic analysis of nuclear-cytoplasmic incompatibility in pea associated with cytoplasm of an accession of wild subspecies Pisum sativum subsp. elatius (Bieb.) Schmalh. Theor. Appl. Genet., 118, 801-809. DOI 10.1007/s00122-008-0940-y. Bogdanova, V.S., Galieva, E.R., Yadrikhinskiy, A.K., Kosterin, O.E. (2012). Inheritance and genetic mapping of two nuclear genes involved in nuclear-cytoplasmic incompatibility in peas (Pisum sativum L.). Theor. Appl. Genet., 124, 1503-1512. DOI 10.1007/s00122-012-1804-z. Bogdanova, V.S., Kosterin, O.E., Yadrikhinskiy, A.K. Wild peas vary in their cross-compatibility with cultivated pea (Pisum sativum subsp. sativum L.) depending on alleles of a nuclear-cytoplasmic incompatibility locus. Theor. Appl. Genet., 127, 1163-1172. DOI10.1007/s00122-014-2288-9. Bogdanova, V.S., Zaytseva, O.O., Mglinets, A.V., Shatskaya, N.V., Kosterin, O.E., Vasiliev, G.V. (2015). Nuclear-cytoplasmic conflict in pea (Pisum sativum L.) is associated with nuclear and plastidic candidate genes encoding Acetyl-CoA carboxylase subunits. PLoS ONE, 10, e0119835. http://dx.doi.org/10.1371/journal. pone.0119835. Braun, A. (1841). Bemerkungen über die Flora von Abyssinien. Flora Oder Allgemeine Botahische Zeitung, 1, 257-288. Campbell, C.G. (1997). Grass Pea, Lathyrus sativus L. Rome: International Pland Genetic Resource Institute, 1997. Conicella, C., Errico, A. (1990). Karyotpe variations in Pisum sativum ect. abyssinicum. Caryologia, 43, 87-97. http://dx.doi.org/10.1080/0008.7114.1990.10796989. Coulot, P., Rabaute, P. (2016). Monographie de Leguminosae de France. 4. Tribus des Fabeae, des Cicereae et des Genisteae. Bulletin de la Société Botanique du Centre-Ouest, 46, 1-902. Ellis, T.H.N., Poyser, S.J., Knox, M.R., Vershinin, A.V., Ambrose, M.J. (1998). Polymorphism of insertion sites of Ty1-copia class retrotransposons and its use for linkage and diversity analysis in pea. Mol. Gen. Genet., 260, 9-19. DOI 10.1007/PL00008630. Elvira-Recuenco, M., Bevan, J.R., Taylor, J.D. (2003). Differential responses to pea bacterial blight in stems, leaves and pods under glasshouse and field conditions. Eur. J. Plant Pathol., 109, 555-564. DOI 10.1023/A:1024798603610. Forster, C., North, H., Afzal, N., Domone, C., Hornostaj, A., Robinson, D.S., Casey, R. (1999). Molecular analysis of a null mutant for pea (Pisum sativum L.) seed lipoxygenase-2. Plant Mol. Biol., 39, 1209-1220. DOI 10.1023/A:1006173313548. Hollaway, G.J., Bretag, T.W., Price T.V. (2007). The epidemiology and management of bacterial blight (Pseudomonas syringae pv. pisi) of field pea (Pisum sativum) in Australia: a review. Aust. J. Agric. Res., 58, 1086-1099. http://dx.doi.org/10.1071/AR06384. International Code of Nomenclature for Algae, Fungi, and Plants (Melbourne Code). (2012). Oberreifenberg: Koeltz Scientific Books. Jaubert, H.-F., Spach, E. (1842). Illustrationes Plantarum Orientalium. Tomus 1. Parisiis: Roret bibliopolam. Jing, R., Vershinin, A., Grzebota, J., Shaw, P., Smýkal, P., Marshall, D., Ambrose, M.J., Ellis, T.H.N., Flavell, A.J. (2010). The genetic diversity and evolution of field pea (Pisum) studied by high throughput retrotransposon based insertion polymorphism (RBIP) marker analysis. BMC Evol., Biol., 10, 44. DOI 10.1186/1471-2148-10-44. Kosterin, O.E., Bogdanova, V.S. (2008). Relationship of wild and cultivated forms of Pisum L. as inferred from an analysis of three markers, of the plastid, mitochondrial and nuclear genomes. Genet. Res. Crop. Evol., 55, 735-755. DOI 10.1007/s10722-007-9281-y. Kosterin O.E., Bogdanova, V.S. (2014). Efficiently of hand pollination in different pea (Pisum) species and subspecies. Ind. J. Genet. 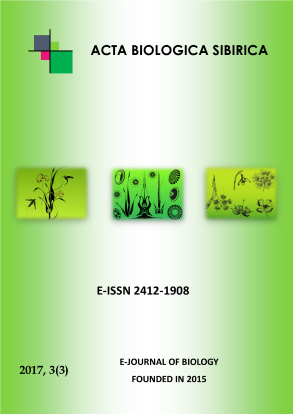 Plant Breeding., 74, 50-55. DOI 10.5958/j.0975-6906.74.1.007. Kosterin, O.E., Bogdanova, V.S. (2015). Reciprocal compatibility within the genus Pisum L. as studied in F1 hybrids: 1. Crosses involving P. sativum L. subsp. sativum. Genet. Resour. Crop Evol., 62, 691-709. DOI 10.1007/s10722-014-0189-z. Kosterin, O.E., Zaytseva, O.O., Bogdanova, V.S., Ambrose, M. (2010). New data on three molecular markers from different cellular genomes in Mediterranean accessions reveal new insights into phylogeography of Pisum sativum L. subsp. elatuis (Beib.) Schmalh. Genet. Res. Crop. Evol., 57, 733-739. DOI 10.1007/s10722-009-9511-6. Lamarck, J.B. de. (1779). Flore Françoise, ou Description Succinte de Toutes des Plantes qui Croiffent Naturellement en France. Paris. Lamm, R. (1951). Cytogenetical studies on translocations in Pisum. Hereditas, 37, 356-372. DOI 10.1111/j.1601-5223.1951.tb02899.x. Lamm, R., Miravalle, R.J. (1959). A translocation tester set in Pisum. Hereditas, 45, 417-440. DOI 10.1111/j.1601-5223.1959.tb03059.x. Lamprecht, H. (1963). Zur Kenntnis von Pisum arvense L. oect. abyssinicum Braun, mit genetischen und zytologischen Ergebnissen. Agri. Hort. Genet., 21, 35-55. Lamprecht, H. (1964). Partielle sterilitat und chromosomenstruktur bei Pisum. Agri. Hort. Genet., 22, 56-138. Maxted N., Ambrose M. (2001). Peas (Pisum L.). Eds. N. Maxted, S.J. Bennett. Plant Genetic Resources of Legumes in the Mediterranean Current Plant Science and Biotechnology in Agriculture. Dordrecht: Kluwer Acad. Publ., 39, 181-190. Maxted N., Kell S.P. (2009). Establishment of a global network for the in situ conservation of crop wild relatives: status and needs. FAO Commission on Genetic Resources for Food and Agriculture. Rome. DOI 10.1023/B:BIOC.0000011719.03230.17. Mayr, E. (1966). Animal species and evolution. Cambridge, MA: The Belknap Press of Harvard University Press. Rosen von, D. (1944). Artkeuzungen in der gattung Pisum. insbesondere zwischen P. sativum L. und P. abyssinicum Braun. Hereditas, 30, 261-392. Saccardo, F. (1971). Crosses among Pisum species. Pisum Newslett., 3, 38. Schaefer, H., Hechenleitner, P., Santos-Guerra, A., Menezes, de Sequeira M., Pennington R.T., Kenicer G., Carine M.A. (2012). Systematics, biogeography, and character evolution of the legume tribe Fabeae with special focus on the middle-Atlantic island lineages. BMC Evol. Biol., 12, 250. DOI 10.1186/1471-2148-12-250. Singh, R.J. (2003). Plant Cytogenetics. Boca Raton: CRC Press. Soldano, A. (1992). Riproposizione di taxa sottospecifici prioritari dovuti a botanici italiani. Natura Bresciana (Ann. Mus. Civ. Sci. Nat., Brescia), 27(1990-1991), 51-56. The Pisum-Genebank. (1984). Origin Listing of Weibullsholm collection. Landscrona: Weibullsholm Plant Breeding Institute. Vershinin, A.V., Allnutt, T.R., Knox, M.R., Ambrose, M.J. (2003). Transposable elements reveal the impact of introgression, rather than transposition, in Pisum diversity, evolution, and domestication. Mol. Biol. Evol., 20, 2067-2075. DOI 10.1093/molbev/msg220. Weeden, N.F. (2007). Genetic changes accompahying the domestication of Pisum sativum: is there a common genetic basis to the ‘domestication syndrome’ for legumes? Ann. Bot., 100, 1017-1025. DOI 10.1093/aob/mcm122. Zaytseva, O.O., Bogdanova, V.S., Kosterin, O.E. (2012). Phylogenetic reconstruction at the species and intraspecies levels in the genus Pisum (L.) (peas) using a histone H1 gene. Gene, 504, 192-202. http://dx.doi.org/10.1016/j.gene.2012.05.026. Zaytseva, O.O., Gunbin, K.V., Mglinets, A.V., Kosterin, O.E. (2015). Divergence and population traits in evolution of the genus Pisum L. as reconstructed using genes of two histone H1 subtypes showing different phylogenetic resolution. Gene, 556, 235-244. ttp://dx.doi.org/10.1016/j.gene.2014.11.062. Zaytseva, O.O., Bogdanova V.S., Mglinets A.V., Kosterin O.E. (2017). Refinement of the collection of wild peas (Pisum L.) and search for the area of pea domestication with a deletion in the plastidic psbA-trnH spacer. Genet. Resour. Crop. Evol., 64, 1417-1430. DOI 10.1007/s10722-016-0446-4.